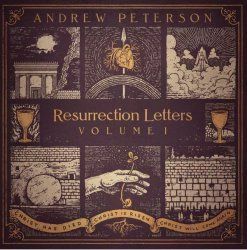 Resurrection Letters, Vol. I features songs like “Is He Worthy?,” “I’ve seen Too Much” and “His Heart Beats,” the latter track being heard on Peterson’s Behold the Lamb of God tour last year. The song is about that glorious moment in the tomb when Jesus, who was dead, came back to life. So if you have already read the review of "Resurrection Letters: Prologue" then you will already know about the crazy time frame of this album. In a nutshell Andrew released an album 10 years ago called "Resurrection Letters: Vol 2" which at the time was a little bit odd, because there was no volume 1! He always had the feeling that there was more to be said that should come before those songs, so Andrew went out on a limb. Now though he has completed this first volume, and prior to this release he also released the prologue which talks about the moments of Christ's death and burial. This 9-track album picks up the story in the first song with Jesus in the tomb as His body comes back to life. This song is incredibly poetic and brilliantly poetic, after the first couple of verses describing the victory over death, the pre-chorus almost drops into a hymn as Andrew sings "Crown Him the Lord of life". This song just soars as it details the last enemy to be destroyed is death and that because Jesus heart beats, ours also beat and one day we, along with all the saints, will rise from our graves. If you want one song to listen to which will encourage you to buy this album then try this one! The next track, "Risen Indeed", takes us on another poetic liturgical journey as it talks about the end of winter and the beginning of spring, which combines this with Peter racing to the garden and the long term promises that Jesus' resurrection fulfills. The chorus echoes the last part of the Easter liturgy of Christ is Risen, Risen indeed. I would say that with this style the vocal reminds me of Michael W. Smith on this track. "Remember Me" is an epic track which runs to 5 and a half minutes and features 13 verses, choruses and a couple of bridges and an interlude. Looking at the words of the dying thief "Lord remember me when You come into Your kingdom" this looks back through the Bible. How none can come before God because we are all unclean, the need for a willing pure sacrifice, and Christ as a fulfillment of that, securing the future hope of all believers, even that dying thief. If you have ever put yourself in the place of one of the disciples or close followers of Christ and wished that you had experienced those moments then "I've Seen Too Much" is a song for you. We think that if we were there our faith would be stronger, but this is about a disciple who is weary of the life he is living, but he's seen everything including Jesus death and experienced him walk into a room with the other disciples. He knows there is ridicule because he isn't believed, but still he cannot deny what took place, or stop talking about it. He can't deny what happened but sometimes, even though he experienced it, doubt still creeps in! "Remember and Proclaim" is a song that is written for celebrating communion reminding us of the what we are doing when we break bread together. Both sides of this are important, both the remembrance and the proclamation that Christ will come again. I like this song and it has a different vibe to many of the songs that are written for communion, but it's not one of my favourites! "Maybe Next Year" doesn't sound like a traditionally Jewish song, but it's clearly written with that community in mind. It talks about going to the Western Wall (also known as the Wailing Wall) and there are some interesting images here that show Christ as the fulfillment of the promises that the Jews are still waiting for. "Rise Up" looks towards the day when God's justice will be served and how the resurrection foreshadows God's ultimate judgement and the wrath of God is poured out on those who mistreated His children. "Is He Worthy?" is something a little different as the singer asks a number of questions which have a choral answer. This partly feels like some traditional liturgy but I believe it's the idea of the questions being asked in Heaven of what should be coming and the worthiness of the Lamb. It's another absolutely beautiful song which really, gently brings it's point to rest, that no-one is worthy except Jesus. He is the only one in all of history who meets all the criteria. If nothing else this song means you want to join in with the simple responses back to the singer. The last track "All Things Together" takes it's cue directly from Colossians 1 v 15 - with this being the point of reference that because of Christ's resurrection everything is held together by Him and for Him. I love it when someone can bring scripture alive like this where you have to piece together what is being referenced and livening it up to be properly considered, because this passage is quite familiar it's one that just we just read and skip through, but this song opened up more meaning to me. That's what good Biblical music should be able to do for you! Added to the prologue this is an excellent set of songs, cleverly written and expertly put together with music that ideally compliments the thoughts being expressed. It may have taken 10 years in the thought and actually putting it together, but it's been well worth it. These songs are some that you can sit and listen and have a whole spiritual meal if you want to take them apart and examine them, but at the same time you can sit and rest and soak in them too. Added to the Prologue these are a brilliantly executed, faith building look at Christ's death and what His resurrection means for both us now and as the fulfillment of scripture.